It took me quite awhile but here I am writing about my recent trip. 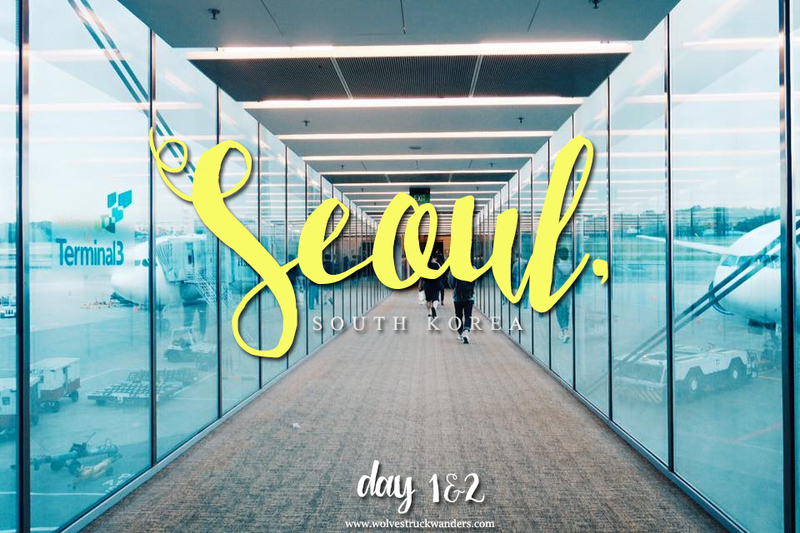 If you follow me on instagram, you'd know that I spent a whole week in Seoul and it did not struck me that I was actually heading there until I was actually in the bus driving along the expressway with a snow-tip mountain view. I was too stoked for emotions but ironically, Korea isn't even one of the country that is on my to-visit list. Nonetheless, I was glad I took up the job offer and I definitely miss it there, despite spending only a week in the cold, yet beautiful city. An opportunity of a lifetime indeed. It was an extremely groggy morning, having to end work at two in the morning that same day and having to report to my tour manager and sales executive at Changi Airport as early as five. I was so restless (and probably, unknowingly excited) that I couldn't sleep on the flight. I forgot to bring my laptop so I browsed through the entertainment system and watched American Sniper instead. Like as if watching war movies would help calm me down. I sat alone but made friends with this student infront of me. It was her first flight, how cute. If you think Changi Airport is huge, you have yet to see Incheon's. It took us at least half an hour to get from one terminal to the other with a whole lot of walking and having to take their monorail once. Don't get me wrong, they are really efficient and tourist friendly. It's just super huge in size, that's all. Upon reaching, we met up with our Korean colleagues and made our way to Seoul. Drivers drive on the left side here. I took this picture while on the highway connecting Incheon to Seoul. I have no idea what mountain that is, but this was the view that I was talking about - it was this view that struck me that I am actually traveling for a living without having to look good doing it. I wish I was pretty enough to be an air stewardess like many of my friends and be in a different country every other week but unfortunately the only kebaya I can fit is a large or probably extra... LOL. The first and only stop of our first day in Seoul was the dinner place. Seeing how it was our first meal here,we enjoyed an authentic Korean dish. Another weird food hunt stroked off my bucketlist - to eat Bibimpap in Korea! After dinner, the school and I checked into Golden Seoul Hotel, where I thanked god a million times for letting me have the room with a city view instead of having to face a wall. Also, there was a cute convenient store right across the street from where the hotel was - read my full review on the hotel here. The second day started bright and early. On the itinerary for the second day, we have Trick Eye museum - lunch - Little Angels Dance Academy - dinner - rest. The whole trip looked alot like this because a) it was a work trip so everything has been pre-planned by the school/agency and b) the main objective of this trip was for the students to experience the exchange program and interact + learn some Korean culture. Mornings are pretty cold here in Seoul and you can't go anywhere without at least having a cardigan in your bag. We started off with an amazing breakfast spread at the hotel's cafe and I am definitely loving how the nature blends in with the infrastructure here. I have never watched any Korean dramas, but I have been told that this hotel was the filming ground for many of those. After ten minutes of tilting my head to the side, trying to figure the different illusions out, I headed out and landed on Hongdae Street! I didn't realize I was within the vicinity of Hongik University until the tour manager told me. I went in search of a Global ATM and withdrew some Korean cash before having my colleague bring me explore a little of the area and splurging a little. Hongdae Street consists of shops that are mainly ran by students for students. Unfortunately for us, we were there way too early in the morning (around ten) and most of the shops were still closed shut. I was so disappointed and kept peering into the different shop windows, feeling more and more heartbroken everytime I saw pretty clothes costing less than 100W. One thing I love to do while traveling, is to look at how locals live everyday life. Lunch was at a Korean Shabu Shabu restaurant. While everyone else had barbecued beef, I was feeling rather bloated and attacked their sorbet ice cream section instead. That was until I was introduced by my colleagues to the Tteokbokki. It is actually a popular Korean snack food made from soft rice cake, fish cake and sweet red chili sauce. I don't know how something with such simple ingredients could taste so good, but yes, I was addicted. After lunch, that was when the main activities for this trip began. I was in charge of the arts group so there was a whole lot of singing and dancing for me, including an amazing performance put up by both the Singaporean and Korean kids. I'll get to that later, but after lunch, we were brought to Little Angels of Korea. Little Angels is an extremely established dance and choir ensemble that was, as inferred from their site, "founded to promote Korean traditional culture around the globe, for the sake of world peace". Google them and you'll see just how famous they are. I was super impressed from the moment I stepped in and was still impressed with how good they are when I left on the last day. All of their students were super talented (they can dance AND sing extremely well) and I fell in love with the interior of the Universal Arts Center immediately. The first few hours of the visit was spent touring the place with their friendly Deputy General Manager, Mr Chung Won Park and shortly after that, the kids went to their respective divisions (dance/choir) and started their practice, while I was them in awe. That's about it for day two.